Scientists cannot travel into the past to take the Earth's temperature so they use proxies to discern past climates, and one of the most common methods for obtaining such data is derived from the remains of tiny marine organisms called foraminifera found in oceanic sediment cores. These "forams," as they are called, are sand-grained-sized marine protists that make shells composed of calcite. When they grow, they incorporate magnesium from seawater into their shells. When ocean temperatures are warmer, forams incorporate more magnesium; less when the temperatures are cooler. As a result, scientists can tell from the amount of magnesium what the temperature of the seawater was thousands, even millions of years ago. These proxies are important tools for understanding past climate. However, studies of live forams reveal that shell magnesium can vary, even when seawater temperature is constant. A new study published this week in the journal Nature Communications affirms that magnesium variability is linked to the day/night (light/dark) cycle in simple, single-celled forams and extends the findings to more complex multi-chambered foraminifera. 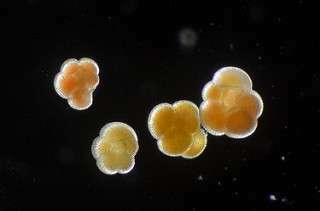 To understand how forams develop and what causes magnesium variability, the team of scientists from Oregon State, University of California, Davis, University of Washington and Pacific Northwest National Laboratory grew the multi-chambered species, Neogloboquadrina dutertrei, in a laboratory under highly controlled conditions. They used high-resolution imaging techniques to "map" the composition of these lab-grown specimens. "We found that high-magnesium is precipitated at night, and low-magnesium is added to the shells during the day, similar to the growth patterns of the single-chambered species," said Jennifer S. Fehrenbacher, an ocean biogeochemist and paleoceanographer at Oregon State University and lead author on the study. "This confirms that magnesium variability is driven by the same mechanism in two species with two different ecological niches. We can now say with some level of confidence that magnesium-banding is intrinsically linked to shell formation processes as opposed to other environmental factors. "The variability in magnesium content of the shells doesn't change the utility of forams as a proxy for temperature. Rather, our results give us new insights into how these organisms build their shells and lends confidence to their utility as tools for reconstructing temperatures."